Starwood Hotels and Resorts has announced plans to debut in South Australia with the signing of Aloft Adelaide in the state capital. 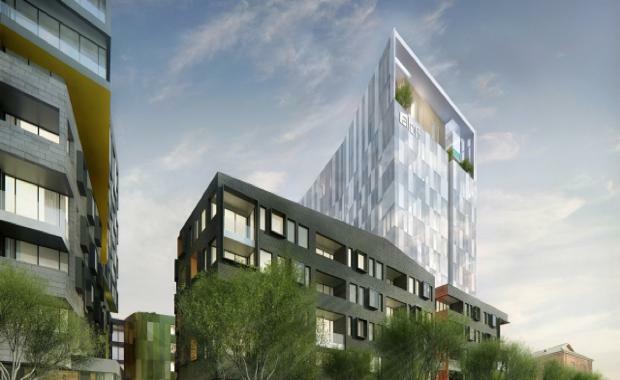 Owned by local developer, Sturt Land Pty Ltd, and in a joint venture between local construction group Tagara and Melbourne-based developer Colvid, the signing of Aloft Adelaide marks the third of their brand's properties to enter the Australian market. Slated to open early 2018, the new-build hotel will form the centrepiece of New Mayfield, a mixed-use development set to reinvigorate inner-city Adelaide. Starwood Hotels & Resorts, Pacific, Regional Vice President Sean Hunt said, "We are thrilled to be expanding into South Australia for the first time with the signing of Aloft Adelaide. ""Adelaide is set for major growth over the next few years and we foresee significant business and leisure demand for innovative and design-led hotel options, such as Aloft. "Located just 20 minutes away from Adelaide Airport at 43-69 Sturt Street, Aloft Adelaide will feature 200 loft-like guest rooms. The hotel will also feature an indoor glass bottom rooftop pool, 24-hour fitness centre with a rooftop running track, and 500 square metres of flexible meeting space. Designed by globally renowned architecture firm Woods Bagot and local landscape architects Oxigen, Aloft Adelaide will introduce a new age of design to Adelaide's emerging hotel scene. The hotel will open as part of phase two of the New Mayfield development, that features an exciting mix of sustainably designed residential, retail and dining spaces, cycle-ways and an integrated village square with public art installations and water features. Sturt Land Pty Ltd Director David Bertram said, "The New Mayfield project will form a vibrant, social space in the heart of Adelaide creating an ideal platform to showcase Starwood's design-led Aloft brand. "With an overall injection of $300 million, this development is going to take urban design and living to new levels and Aloft Adelaide will be the jewel in the crown. "Starwood Hotels & Resorts and Sturt Land Pty Ltd share the same vision, to create a modern urban-influenced design which entices locals and visitors seeking a buzzing social scene in an unbeatable city location. We look forward to working with Starwood to make this a reality. "Aloft Adelaide will feature the brand's innovative and exclusive initiatives that set it apart from the competition. The hotel will be amongst the first in the Australian market to showcase Starwood's recently announced SPG Keyless - the hospitality industry's first mobile, keyless entry system allowing guests to use their smart phone as a key. The technology will be available to select Aloft, Element and W Hotels worldwide by the end of 2015. [urbanRelatedPost][/urbanRelatedPost]The signing of Aloft Adelaide follows the recent announcement of the Aloft Sydney Pitt Street, slated to open in October 2016, and last year's announcement of the Aloft Perth Riverdale, set to open in early 2017. Starwood Hotels & Resorts Pacific Director of Acquisitions and Development Andrew Taylor said, "Demand for Aloft is rapidly accelerating and the brand continues to aggressively expand as we near 100 hotels worldwide. "We are experiencing growing interest from investors and developers in the Australian market, who are attracted to the brand's DNA, which fills a void in the hospitality sector. No other brand caters to the evolving global traveler like the Aloft brand, with its distinct design, buzzing social scene and innovative, tech-forward offerings. We're excited by its potential here in Australia."